In 1977, The Materials Technology Institute was founded to provide like-minded Chemical Processing Industry engineers with crucial research and resources, collaborative opportunities and trusted answers to industry challenges. The founding engineers met at the 1976 NACE Conference in Toronto, Ontario and realized that if they pooled their collected resources and brainpower, they could significantly increase their abilities to leverage funding for research. Founders Bob Puyear and Bert Krisher of Monsanto, Paul Dillon and George Elder of Union Carbide and Warren Pollock of DuPont shared the vision of a collaborative network of industry experts and major companies working to solve major CPI issues. The first Membership Meeting was held on February 23, 1977. Organization structures such as the Board of Representatives (BOD) were then developed with intent of bringing together representatives from member companies to approve funding for research projects, technical programs and technology development. The projects in particular became a key value for MTI members, allowing them to achieve high return on investments by finding new answers to challenges they could not solve on their own. Now, MTI and it’s 66 member companies in 13 countries continue to provide global leadership in materials technology research and solutions. MTI has compiled over four decades of not-for-profit research, resources and collaborative efforts, and continues to foster lasting partnerships with its member companies. To learn more about MTI’s policies, procedures and governance, click here. MTI was created as a dependable resource, developed by engineers for engineers. Our Vision: A global network recognized as the preferred source of material technology solutions for industrial process companies. Our Mission: MTI maximizes member asset performance by providing global leadership in materials technology for industrial processing companies to improve safety, sustainability, reliability and profitability. Nonproprietary research and projects are conducted on selection, design, fabrication, testing, inspection and performance of materials used in the process industries. This research is focused on developing valuable new technologies and on transferring both new and existing knowledge to day-to-day practices. MTI provides numerous opportunities for members to continue professional development through in-person and online training sessions, MTI books and reports, webinars and seminars. Members have the ability to speak with other industry professionals 24/7 on the TAC Forum to capitalize on the expertise of member company representatives. MTI also offers several in-person networking opportunities such as TAC Meetings, Facility Tours, Training Sessions and Seminars. Members use their networking power to exchange information, leverage resources, develop new projects and find answers to crucial industry challenges. The power of MTI’s expert network and years of research is used to influence the development and appropriate use of pertinent codes, standards and regulations. Take advantage of over 40 years of research and networking power. Click here to learn more about the numerous benefits to becoming an MTI member. 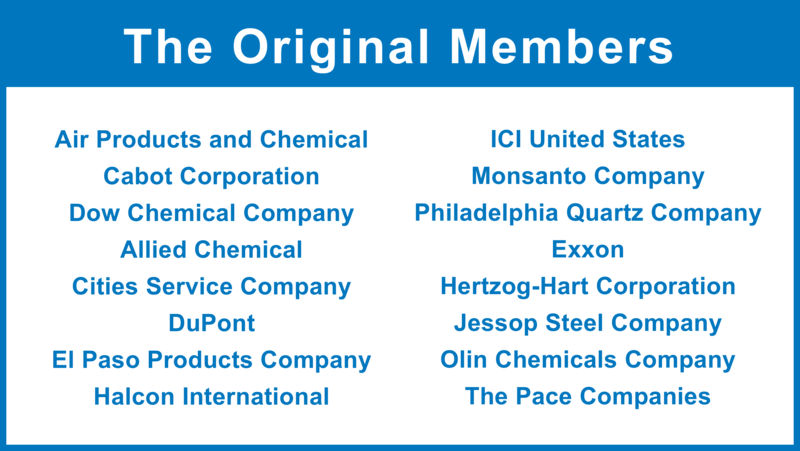 MTI offers many in-person and online opportunities for members to represent their companies. 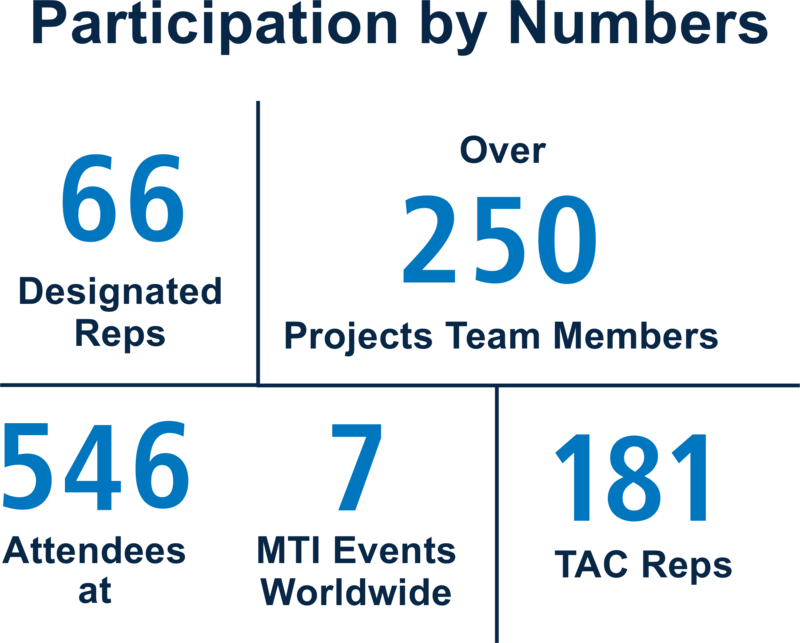 The collective work of our members through their engagement in meetings, projects and leadership roles greatly contribute to the overall achievements of MTI. As our community continues to collaborate and grow, our resources strengthen and increase. 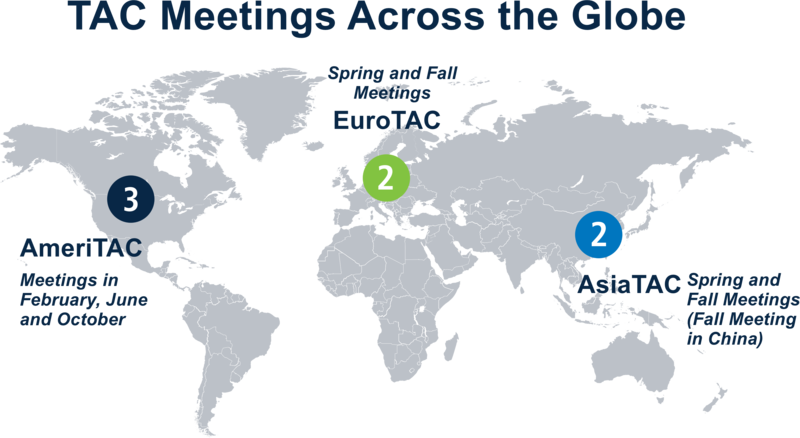 MTI holds 7 Technical Advisory Council (TAC) Meetings at year in locations all over the globe. There are three TAC Groups: AmeriTAC, AsiaTAC and EuroTAC. AmeriTAC was formed 40 years ago, and meets three times a year in locations across North America. Click here to visit the AmeriTAC Community. AsiaTAC was started in 2008, and served as a sign of MTI’s growth in global leadership in materials technology. Meetings are held twice a year in locations throughout Asia. Click here to visit the AsiaTAC Community. EuroTAC was established in 2008, and once again showcased MTI efforts in global leadership. Meetings are held twice a year across Europe. Click here to visit the EuroTAC Community. MTI Designated Representatives (DR) serve as the official delegate of their member company. Their role is primarily to represent their company in MTI organizational voting, in matters of dues and as the primary company contact. DRs have access to MTI’s robust website, are able to vote for BOD candidates and can encourage other member company employees to utilize crucial resources and participate in MTI activities. The Designated Representatives of member companies who participate in MTI activities help raise the knowledge base among diverse plant staff and often become the in-house expert, or go-to-person, for materials technology solutions. In addition, the interaction among materials specialists and the leadership opportunities within MTI enhance career development. Technical Advisory Council (TAC) Representatives act as an ambassador of their member company at TAC meetings. They have the ability to vote on projects at TAC Meetings, to monitor projects and are also responsible for distributing MTI information and products to company personnel. Becoming a TAC Representative allows for opportunities in personal, professional and leadership growth. TAC representation is divided into three regional areas (AmeriTAC, EuroTAC and AsiaTAC) corresponding to MTI TAC Meeting locations. Each area is represented by one TAC rep, and up to three individuals may be appointed per company to fill each of the three regional roles. 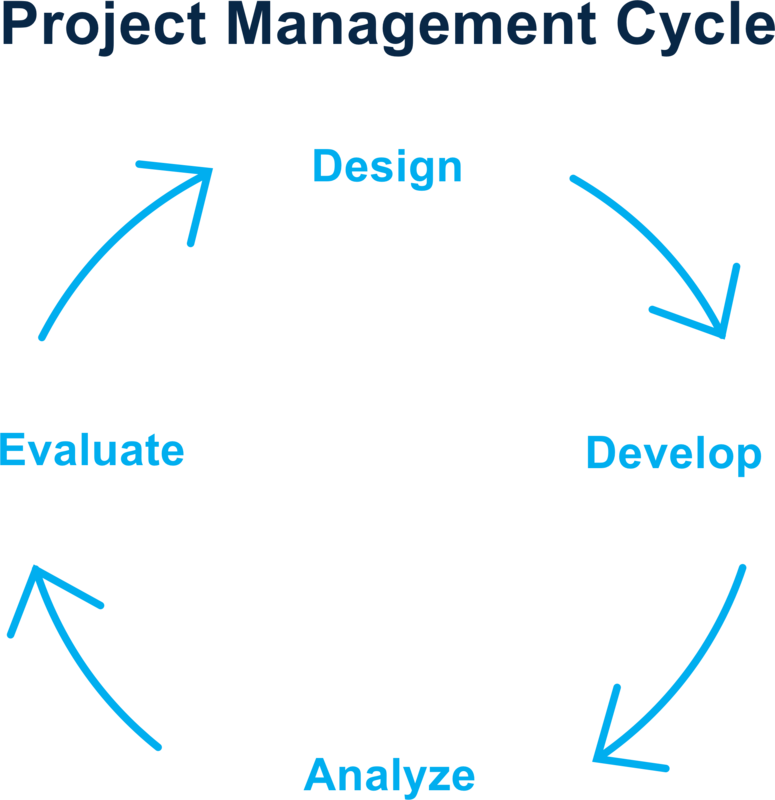 Project Champions (PC) function as the project leader of a Project Development Committee (PDC). Members who fill the role of Champion or Co-Champion identify strategic projects and funding sources, create requests for proposals and oversee projects from start to end. Champions work with the MTI staff project manager to ensure the project maintains high quality standards and adheres to the MTI mission. Becoming a PC provides ample opportunities for professional development and leadership growth. Any authorized employee of a member company can become a Project Champion. Members of the Board of Directors (BOD) function as the keepers of MTI’s strategic objectives. They provide consistent, valuable input, while maintaining the MTI mission. BOD Members serve as non-biased leaders to help make decisions that balance the needs of member companies and representatives with those of the overall organization. 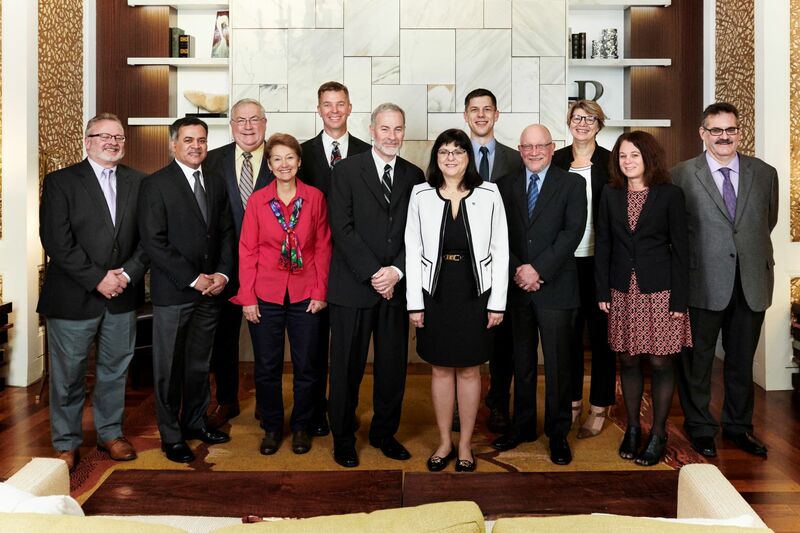 Members of the Board of Directors represent the interest of all people serviced by MTI. Click here to see BOD minutes.